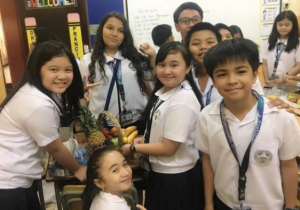 In line with this year’s theme of the Nutrition Month Celebration, “Healthy Diet- Make it a Habit for Life!”, the Intermediate Department had come up with activities that promote good nutrition and physical well-being during the celebration of Nutrition month last July 2-31. The activities were spearheaded by the HELE teachers of the department namely Ms. Mervelous G. Dominguez for Grade 4, Ms. Miles V. Pascua for Grade 5 and Ms. Mary Ann V. Estrada for Grade 6. From the Grade 4 Level: First Placer: Loren Margarette L. Espiritu of Grade 4-Radium, Second Placer: Jeslord Anzia B. Ramboyong of Grade 4-Rhenium and Third Placer is Shikyna Gabrielle R. Mergillano of Grade 4- Ruthenium.For the Grade 5 level, First Placer is Marian Lovie A. Francia of Grade 5-Stradium, Second Placer: Zophia Audrey J. Obejera of Grade 5-Scandium and Avril Ann A. Castelltort of Grade 5- Silver for the Third Place. For the Grade 6 level, First Placer: Ashley Neil M. Ariola of Grade 6-Thallium, Second Placer is Patricia May A. Castelltort and Third Placer is Samantha Chloe L. Liggayu, both from Grade 6- Francium. The qualifiers and winners were recognized during the culminating activity that was held last August 3 at the Multi-Purpose Hall in Building D.